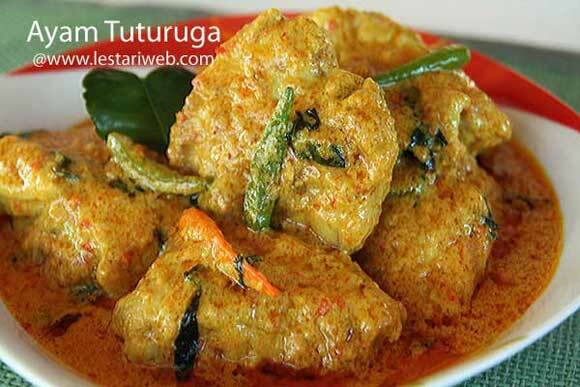 Ayam Tuturuga is a one of typical dishes of Minahasan people who live in North Sulawesi. Many Indonesians also call them as Manadonese, refer to the capital city of North Sulawesi province. The main character of Manadonese dishes is mostly sour and spicy. One of the important ingredients of this recipe is daun pandan or "Pandan leaf". If one free range chicken is probably too much for you, you can also halve the amount of chicken ( any sort as you wish). 1 small chicken ( weighing about 600 gr/20 oz ), cut & washed. Rub the chicken with salt and a half of lime or lemon juice. Put aside. Put all ingredients for the paste in a blender or food processor and blend until smooth. (If necessery add a little bit oil to help the blending process). Heat 2 tbsp oil in a Wok or big saucepan. (Don't add oil if already added in a blender). Stir fry the paste until fragrant & it's colour turns to orange ). 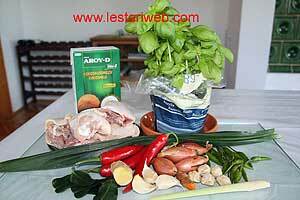 Add the small chillies, lemon grass, kaffir-lime leaf, Pandan leaf & Basil leaves. Add the chicken and stir to mix. Cook until the chicken becomes harder and it's colour turns to white. Pour in the coconut milk, add the half of lime juice & salt. Stir occationally. Adjust the heat into medium and simmer until the coconut milk get boiled & chicken well cooked. Serve hot with rice.